It’s fair to say that The Debut of Stephen Gonsalves didn’t go as well as he would have liked. Debuts rarely do. But for the rest of his life, he can be called a big leaguer. And that’s what every player in the minor leagues dreams of. Monday in the minor leagues, both Rochester and Ft. Myers got a rare day off. But there was some terrific pitching and powerful hitting for Chattanooga. They also added a former big leaguer to their roster. Cedar Rapids scored a dozen and got a great relief appearance. Elizabethton played neighboring Johnson City in a doubleheader. 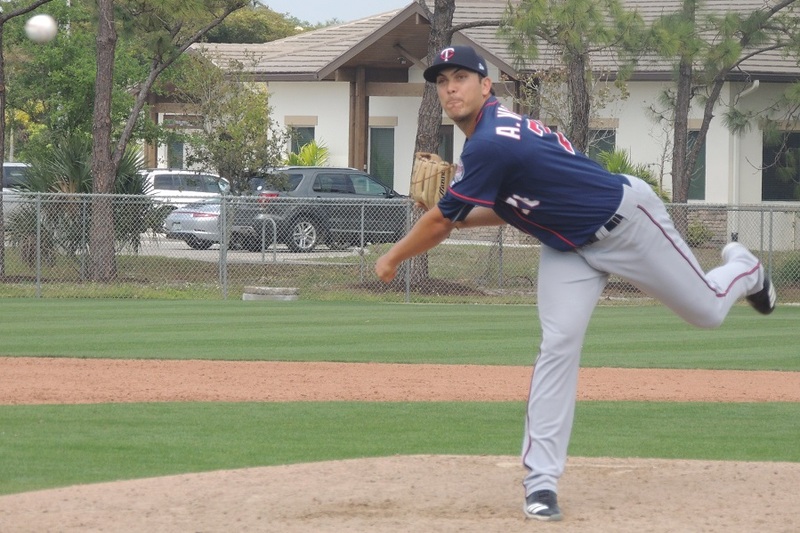 And the GCL Twins got to face first-round pick Matthew Libertore for the third time. Keep reading to find out more on the night in the Twins minor league system on Monday. As always, please feel free to discuss and ask questions. Chattanooga put RHP Omar Bencomo (foot) and infielder Chris Paul finger) on the disabled list. Catcher Brian Olson was activated. Also, the Twins signed RHP Austin Adams from the Sugar Land Skeeters and placed him on the Lookouts roster. Adams is 31-years-old and pitched in 53 games for Cleveland between 2014 and 2016. Also, Kennys Vargas was named the International League’s hitter of the week. The Lookouts used some well-timed long balls to take control of this game. Early on, Luke Raley hit his third Lookout homer, and later, Jimmy Kerrigan hit a long, three-run homer, his fifth with Chattanooga this year. Brian Navarreto went 3-for-4 with a couple of RBIs. Jaylin Davis reached .300 with a 2-for-4 night. He added a walk. Tyler Wells started and went the first five innings. He gave up two runs on seven hits and a walk. He struck out three batters. Williams Ramirez struck out three batters over two scoreless innings. Andrew Vasquez then gave up just one hit over two scoreless innings. He struck out six. The Miracle were also given the day off to watch Gonsalves debut. Or, it’s a scheduled day off. Down 4-3 going into the eighth inning, the Kernels scored four runs in the eighth and another five runs in the ninth to run away with the win in Wisconsin. Gabriel Maciel went 3-for-5 with his second triple and three runs scored. Ryan Jeffers was also 3-for-5 with three runs. Michael Helman went 2-for-4 with a walk and his second double. Trevor Larnach went 2-for-4 with a walk, his fifth double, and three runs scored. Those four were the first four hitters in the Kernels lineup. Number five hitter, Ben Rodriguez, added four RBIs. His 18th double cleared the bases. Tyler Watson started and was charged with four runs on four hits in 5 2/3 innings. He walked five and struck five out. Johan Quezada made his Kernels debut. After missing most of the past two years with shoulder injuries. On this day, he faced ten batters and got ten outs, six via the strikeout. The E-Twins scored six runs in the second inning and held on for a win in Game 1. Kody Funderburk made the start. The lefty gave up four runs on seven hits over 3 2/3 innings. He walked two and struck out four. Blair Lakso came in and got the win. He gave up two runs on two hits and five walks in 1 1/3 innings. Tanner Howell recorded his first E-Twins save with two innings of scoreless ball. He gave up one hit and walked one. Yeltsin Encarnacion led the offense. He went 3-for-3 with his fifth double. He scored three runs and stole his second base. Yunior Severino went 2-for-4 with two RBI. Gilberto Celestino was 2-for-4 with his third double and his eighth stolen base. Jared Akins hit his third double, and Ricky De La Torre hit his ninth. With two outs in the bottom of the ninth, Trevor Casanova singled to score Yeltsin Encarnacion and give the E-Twins the win. Brian Rapp started and gave up two runs on five hits over 4 2/3 innings. He walked two and struck out four. Pedro Garcia came on and did well. He threw 4 1/3 scoreless innings. In the extra innings, both the eighth and the ninth, he was able to leave the bases loaded and keep the game tied. He gave up three hits, walked three and struck out four. Casanova led the way. He went 2-3 with a sacrifice fly to give him two of the three RBIs. The other run scored on a pinch-hit single by Chris Williams. Roberto Molina also had two hits. Gilberto Celestino went 1-for-3 with two walks. The Twins again had the opportunity to try to hit against Rays pitching prospect and 2018 first-round pick Matthew Libertore. It is the third time in the last few weeks that the Twins have faced the lefty. On this day, Libertore gave up three hits over five shutout innings. He struck out eight without issuing a walk. In the three starts combined, he has thrown 14 2/3 scoreless innings. He’s given up six hits, walked none and struck out 19. Shane Carrier led the offense with a 2-for-4 game. Erick Rivera added his fourth double. Andriu Marin started. He gave up two runs on six hits over 3 2/3 innings. He walked one, hit one and struck out five. Dylan Stowell gave up two unearned runs on one hit and two walks in his 1 1/3 innings. He struck out three. Erik Cha recorded the next four outs. He struck out one and didn’t allow a base runner. Niklas Rimmel gave up two runs on four hits over the final two innings. He struck out two. Twins Daily Hitter of the Day: Gabriel Maciel, Cedar Rapids Kernels (3-5, 3B(2), 3 R). Please feel free to ask any questions about Monday’s games, or ask any questions you may have. Great wins for Etwins tonight despite the fact it took over 6 hours to play both games. In Morrison's defense, sounds like the hip was a problem much of the year.But agree with the comments about Vargas.Wish him well in getting a nice contract with someone else over the winter, someone who will give him a real opportunity. Looks like Cedar Rapids is serious about getting into the playoffs with their lead now at 2 games.The infusion of talent from the trading deadline and draft sure has been a boost for them.Big games from Maciel, Jeffers, Larnach and Helman, who got an XBH for a second straight game.Nice debut for Quezada, real nice. Vargas is "on the fast track"! You may say, well,, his May wasn't too awful, but in May, Logan Morrison hit .244/.369/.453 (.822). Vargas should go to Japan or Korea. On this day, he faced seven batters and got seven outs, six via the strikeout. Shouldn't that be ten batters and ten outs? I'm really hoping that Vasquez gets a ST invite next year, potentially even a September call up (not likely, but one can hope). Steady improvement, solid numbers... I'm definitely thinking he deserves a look. Great job by Vasquez. And Q. Tyler Wells did a decent job, not great but good. Too many hits in this one but they aren’t scoring and that’s always a great sign for a pitcher. I’ll take it all day. I've been saying this for years. He would be a folk hero over there. I think he could be a 40-man roster add... but he's borderline. Could someone remind me about Jose Quezada? don't forget about Jose Quezada! Chief, you can go ahead with those retirement plans at the Assisted Living complex. Your services here are no longer needed; Mike's got things covered now. When Vargas was DFAd it was before having this bad season.Every team passed on him. Even the White Soxwho it seems like they take the available Twins minor league batters that comes cheaply and is available. Touché, Sir.Touché.I'll be more specific. Might someone on this site provide me information an Jose Quezada?